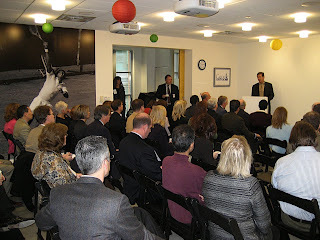 Tuesday morning, my team welcomed the Reston, Virginia community into our office for our first official open house. 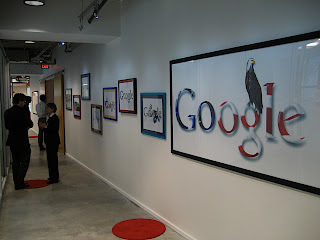 Since we opened our doors in August 2008, everyone in Google Reston has been delighted by the warm reception we've received, and yesterday was a chance to celebrate with local community leaders, non-profits, politicians and press. Our office here in Northern Virginia is dedicated to two things. 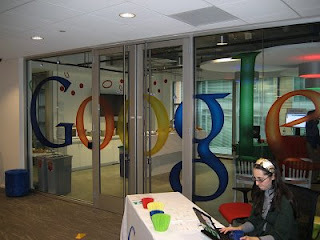 First, it's home to my team, the Federal division of Google's Enterprise Sales group, which packages Google's consumer products for use in business and government. Second, it's home to Google's Vice President and Chief Internet Evangelist, Vint Cerf, who keynoted our program with a talk about, among other things, recent successes in creating an interplanetery Internet. Google Reston is about 20 miles from our Washington, D.C. office, which focuses on public policy and government relations. Joining us in the speaking program were Virginia Delegate Ken Plum, Fairfax County Supervisor Cathy Hudgins, and Fairfax County Economic Development Authority President and CEO Dr. Gerry Gordon. Also joining us to announce their new community partnerships with Google were Reston Interfaith CEO Kerrie Wilson and Fairfax County Public Schools' Dr. Jack Dale, Superintendent, and Jay Garant, Business and Community Partnerships Coordinator. Best of all, we were joined by the original founder of Reston, Robert E. Simon, whose vision for the town has always emphasized quality of life, including the ability for residents to live and work in the same community. Both Vint and I have lived in Northern Virginia (myself in Reston) for over 20 years, so we're proud to say we're making that a reality. Thanks again to Reston for the warm welcome. We look forward to working with the Northern Virginia community and, of course, with the federal government over the long haul.